Data-driven website design is the process by which the structure, layout, and functionality of a website are considered, based on actual usage and site analytics. In a time when we have more data than we know what to do with, how can you use all that information to improve your website and increase traffic? We first need to understand what data really is — there’s a lot more to it than just numbers. There are three types of data. Quantitative data is numerical data. These are things such as analytics or statistics that tell you the number of site visitors, page views, bounce rate, average session duration, demographics, what device they used to get to your site and much more. 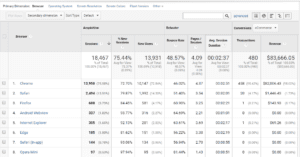 This is the type of data found on Google Analytics, usually shown a typical format of numbers, charts or graphs. Qualitative data is non-numerical data. It can help to tell you about the how or why of your users’ behavior. These are things like, why did someone choose your product or how are they going to use it. While qualitative data may be harder to visualize, it still plays a critical role in your website design process. 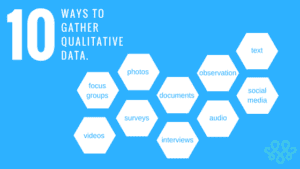 Qualitative data will allow for more engaging experiences and increase the overall value of your company or offerings. You can gather qualitative data by sending email surveys asking your customers to give feedback on your website, products, etc. It provides some much-needed perspective. People tend to believe that quantitative data is more important or reliable than qualitative data. Sure, quantitative data is easier to gather and analyze, but it’s essentially meaningless without qualitative data. Empirical data is data that’s been gathered through intentional observation and experimentation. For example, doing some A/B testing or changing a design feature on your website and monitoring it to see how people respond. Use experimentation to see what your customers respond better or worse to. The nice thing about using data to drive design is that it gives you information about what works and what falls flat. Ultimately, you have to leave your opinions, preferences, and biases at the door when designing a website. This is because often in the design process, personal preference can take priority over rational design decision making. However, this may not be what your users need. Collecting data after you do something like changing a design feature will tell you whether the changes you’ve made are working. It will also help you understand better what your users respond to and what they don’t. First off, pinpointing a problem area on your website is extremely hard without any data. Then once you find the problem, you also need data to find a solution. If you come up with specific and targeted solutions based on data, you can test each solution out to see which one best solves the issue. Essentially, data is saving you time to find the problem and come up with solutions to test. At the end of the day, connecting with your users, getting to know them better, and giving them the best online experience should be your end goal. Good data can tell you a whole lot about your users, from their preferences, behaviors, reactions, demographics, and much more. Understanding the context of data-driven web design allows you to see that good data can be the golden ticket to a better website. 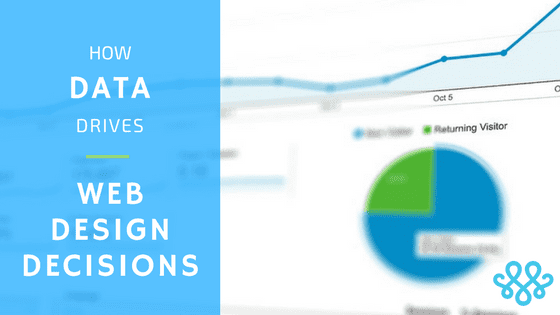 Using data-driven designs for your website will result in a better website overall and will increase your brand presence, conversions, customer retention, and much, much more.